What’s better than soft, clean carpet? We know the answer: nothing. If you have carpet, you know that nothing beats the look and feel of that clean lushness beneath your feet. That’s why Exact Clean Carpet Cleaner Solihull, Redditch & Bromsgrove is excited to tell you about our top-quality cleaning services. Our quality professionals will have your carpet looking better than ever! We know what it takes to get even the messiest carpet clean, and we understand why it’s important to do so. Let me ask you a question: do you want to breathe dirty air? Okay, probably not. How about your pets? Your kids? Though we don’t often think of it, dirty carpets are a major cause of bad air. Allergens from our carpets can be released into the air and cause our households to become sick. And oftentimes, we don’t even realize it’s happening. We get so caught up in the hustle and bustle of daily life that we don’t have the time to clean our carpets—at least not to the standard to which they should be cleaned. We’re here to give you a hand. Our industry-leading professionals know just what it takes to get your carpets looking newly-manufactured. We use only the best equipment to make sure that your carpets are cleaned safely and allergy-free. What’s more, we inspect your carpet beforehand to know just what type of care your floors require. We understand that no two homes are the same. That’s why we are prepared to give your house the undivided attention it deserves. So don’t hesitate to contact us. 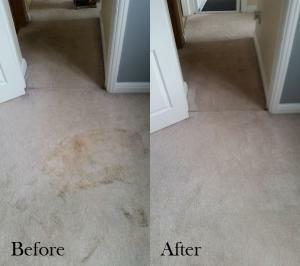 If you are looking for an affordable way to get your carpets clean in no time, simply send us a message. We urge you to visit our website to see a full list of our services and prices. We’re sure you won’t be disappointed! This is one of our recent jobs done in Bromsgrove. This heavily stained polypropylene carpet looked almost as good after our clean as it was on the day when it was put down. Customer was seriously thinking about replacing the carpet but after reading our great online reviews left by previous customers he decided to call us for advice. During inspection stage we have explained the whole process and did exactly what we said we will do. We do provide free no obligated quotations. 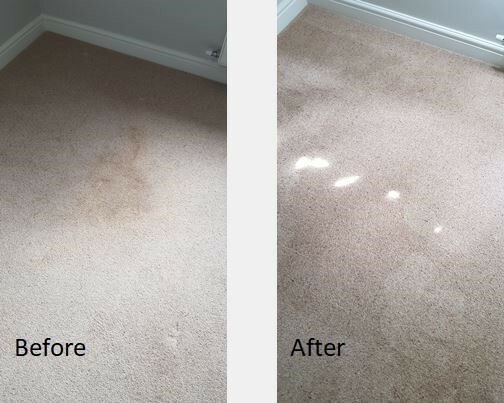 If there is nothing we will be able to do with your carpet due to type of stain and fibre we will tell you that at this stage. So why not to call us first before you will decide to replace the carpet, we might be able to save you a few £££. This six years old suite was heavily soiled and did come up like new. It has been cleaned using hot water extraction method. 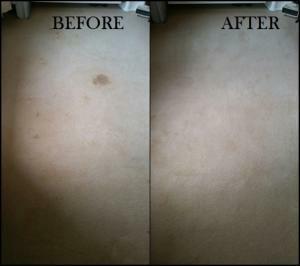 Most important when cleaning carpets or upholstery is breaking all the soil down before extracting stage. Like with most jobs preparation is the key. Last week’s job done for new customer in Stratford-upon-Avon. The stain was made by a dog which had diarrhoea and messed on the carpet. Stained carpet on the picture was fitted couple of months ago and is a good quality wool mix 80/20. Luckily customer phoned me first before reaching for a DIY carpet cleaning product. When it comes to removing stains on wool it is very important to use correct product first, wrong attempt could set the stain to permanent. Please do not search the internet for first aid treatment advice as most of them are totally wrong and instead of helping they will make it worst while followed on wool carpet (believe me I see it every day). While they might work on polypropylene carpet which is stain resistant they might complicate chemistry and even set the stain to permanent on wool. 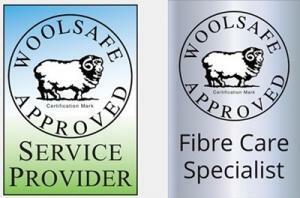 I highly advice to go to the WoolSafe organisation website https://www.woolsafe.org/ where you will find some first aid stain removal tips or search for your local Fibre Care Specialist. 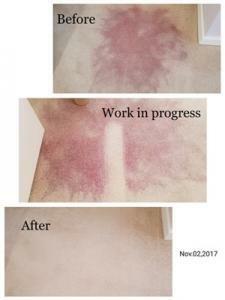 Removing this stain on the picture was a long process, cleaning the mess first, than dealing with dye damage done to the carpet already and sanitizing it to finish. The white patches on after photo is the sun coming through the blinds. I do highly recommend all wool carpet owners to get it protected. The protector creates a barrier between the carpet fibre and the soiling which gives more chance to bring it back to as new condition when you will decide to get it professionally cleaned. When this time has gone. 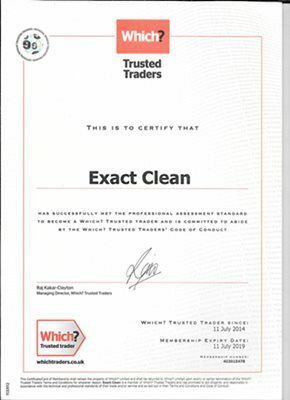 It has been four years now since Exact Clean Carpet Cleaner Redditch, Solihull & Bromsgrove has joint the Which? scheme. 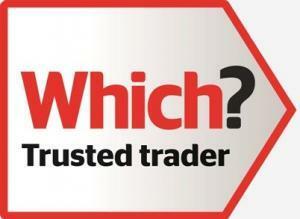 I am a proud member of the scheme and was trusted by many customers because I am endorsed by Which?. For me it is a big responsibility and always do my best to give my customers the best, no trouble and pleasant experience. 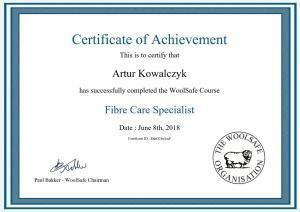 My latest achievement, I am officially a Fibre Care Specialis. Woolsafe course exam passed and another industry qualification gained by Exact Clean Carpet Cleaner Redditch, Solihull & Bromsgrove. At Exact Clean we are now offering leather restoration services along with our carpet, rug upholstery and leather cleaning services. 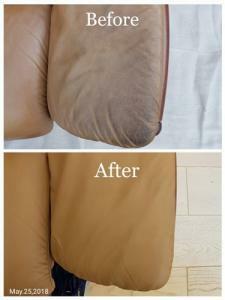 If you are having leather sofa or car seat which require some fixing and colour need restoring then please get in touch. On the picture below our latest job done last week outside Stratford-upon-Avon. Had a phone call this morning, gentelman was asking if I can help with removing accidental soli from the carpet. Of course I couldn’t leave customer to deal with it on his own so done this job as a last job of a day. All soil removed plus carpet and the bedroom fully sanitised using my fogger along with NHS approved antimicrobial Formula 429 ready for the evening to use. Commercial carpet cleaning job carried out over last weekend in Redditch. This is the area by the bar where this lovely axminster carpet was covered by cooking grease from the kitchen. It was very challenging job as it hasn’t been cleaned for a long time. The customer was very pleased as carpet came up almost as good as new. Exact Clean provides commercial carpet cleaning in Redditch, Solihull, Bromsgrove, Stratford-upon-Avon and most parts of Birmingham. Please get in touch for free no obligated quote. Exact Clean is which endorsed carpet cleaning company and associate member of the National Carpet Cleaners Association so you can trust us when it comes to clean your valuable carpets or furnishings. 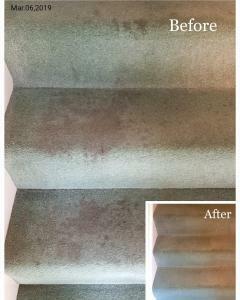 First job today removing red wine stain from cream carpet. Red wine removing can be either easy straight forward or like this one quite challenging and require specific knowledge. It took me over two hours to flush it all from the carpet and it did require working on both side of pH scale as some of dyes in this particular wine responded to acidic solution where others to alkaline. It was the whole bottle of nice red wine from M&S smashed on the carpet. Customer’s daughter adviced her mum to hire rug doctor and do it herself. I can’t see this job being done with rug doctor available cleaning solutions and without overwettig the carpet using this machine. I did use 40 litres of water to flush it completely out. If I wouldn’t use low moisture tools which did allow me working with high water pressure without risk of overwettig along with my high powered extraction machine I wouldn’t be able to get results like that. Dog’s poop removal from wool carpet in Studley. One of my customers dog got distressed and made a mess on the carpet. I have turned up on the same day and cleaned and sanitized the carpet. For this type of jobs I use NHS approved product to kill bacteria before attempting cleaning. Also when I finish the job all my equipment is cleaned and sanitized so there is no risk of cross contamination. I provide my cleaning and restoration services in Redditch, Solihull, Bromsgrove and Stratford-upon-Avon. Job from last week. 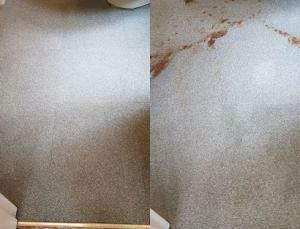 Carpet cleaning and restoration in Redditch. Customer didn’t believe when I said it will come up almost as good as new:) You would’t get this results just with using high powered extraction machine. It is technician who is cleaning the carpets. You must have knowledge in industry’s products, carpets types and constructions and soils to be able to achieve top results. Please get in touch for free no obligated quote. 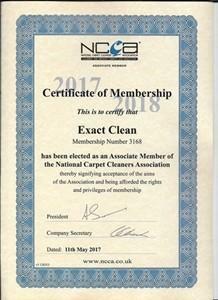 Artur Kowalczyk t/a Exact Clean has been elected as an associate member of the National Carpet Cleaners Association (NCCA). The NCCA is an independent and nationally recognised body dedicated to the cleaning of carpets, upholstery and soft furnishing. As a NCCA member I am obligated to provide the highest standards of service and workmanship. Over the years of being involved in carpet cleaning industry during extraction soil form wool carpets I discovered small bleached patches, mainly on the traffic area. These actually are the areas where the colour was stripped out by oxidisers which very often are in spot and stain removers available in the markets. I must say lots of these products are not safe to use on your valuable wool carpets. They can be used on polypropylene but not on wool. If you’ve had an accident on your wool carpet please make sure that the product which you are going to try to remove the spot or stain is wool safe as you might create white stain instead or damage carpet fibers as wool is pH sensitive. You can always contact Artur Kowalczyk form Exact Clean for advice or for free no obligated quote for stain removal service. I cover Solihull, South Birmingham, Redditch, Bromsgrove and Stratford-upon-Avon. Over the years being involved in carpet cleaning industry I have been asked many times by my customers from Solihull, Birmingham, Redditch, Bromsgrove and Stratford-upon-Avon if this is true that once they clean their carpets they will be getting dirty quicker. The answer to this question is “NO” if they will be cleaned by knowledgeable technician. The main reason which causing it is that lots of carpet cleaners are using high pH detergents and rinse it with just plain water so they leave lots of detergent sticky residue which leads to rapid re-soiling. It is important to leave carpet as dry as possible, use acidic rinse or specially designed alkaline rinse which will flash pre-spray detergent from your carpet, rug or upholstery. At Exact Clean wherever possible we will use detergent free products. Carpets will dry pH neutral and there will be no detergent residue left after clean. If you need professional advice please do not hesitate to get in touch. I must say lots of our work I would classified as restoration jobs not just cleaning. With right knowledge, products and equipments it is often possible to bring carpets back to almost as new condition. 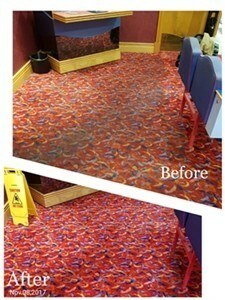 Please have a look at picture below, it is polypropylene Saxony cream carpet we cleaned at Solihull last week. End result, happy customer. Today we did our annual carpet cleaning at National Trust, Coughton Court. We are proud to be the National Trust registered contractor. It is beautiful historical place and it’s always a pleasure to work there. As always we used detergent free products which are safe for carpets and our customers. This products are free rinse so they don’t leave residue behind which might lead to rapid re-soiling like traditional detergents. We cover South Birmingham, Solihull, Shirley, Moseley, Kings Heath, Hockley Heath, Earlswood, Redditch, Alcester, Studley, Bromsgrove, Stratford-upon-Avon and beyond. Arthur has been called in several times to work his magic on our residential and historic carpets and, every time, the results far exceed our expectations. He is incredibly knowledgeable in his trade and we trust him to deliver a safe and excellent service. I have no hesitation in recommending him as he is one of our most valued contractors at the National Trust, Coughton Court. Courteous, efficient, friendly, polite & professional…what more is there? Artur was punctual.. professional & polite. Cleaned all of my carpets upstairs & down… super & cleaned my large white leather suite which now looks like new. Would highly recommend him & I will certainly use him again.